Statutory damages are awarded in civil medical malpractice cases as a result of negligent acts by doctors and other health care providers. However, there are caps set in place that limit the amount of money awarded for damages to injured patients. Discover more about caps on damages in Oregon in our checklist below. If a patient is injured through negligence or omission by a physician, hospital, or other health care provider, this is referred to as medical malpractice. The negligent act may be the result of diagnosis, treatment, or health management errors. When Can A Medical Malpractice Claim Be Filed? In order for a claim to be considered medical malpractice, it must be a violation of the standard of care, caused by negligence, and result in significant damages. For a case to be viable, patients must be able to show that significant injuries or damages occurred due to medical negligence. If the potential economic damages are too low, the cost of pursuing a legal case may outweigh recovery costs. Economic statutory damages are often awarded in medical malpractice cases in which the negligence resulted in a significant injury to the patient. Non-economic awards allow a jury to compensate a medical malpractice victim or their family for intangible damages. Patients who become injured in medical malpractice cases are subject to receive a payout for non-economic damages. However, several states have implemented caps on medical malpractice damage amounts. Damages caps limit the amount of non-economic damage that can be awarded in a case. Each state has its own cap, but the federal government has a $250,000 cap on non-economic damages for medical malpractice claims. Non-economic damages include damages arising out of emotional distress, loss of care, companionship, comfort, and more. What Is Oregon’s Cap On Non-Economic Damages? The current cap on non-economic damages for medical malpractice in the State of Oregon is $500,000, which was set in place in 1987. However, Oregon’s position on damages caps changed in 2016 when the Supreme Court decided Horton v. Oregon Health & Science University, 359 Or. 168. 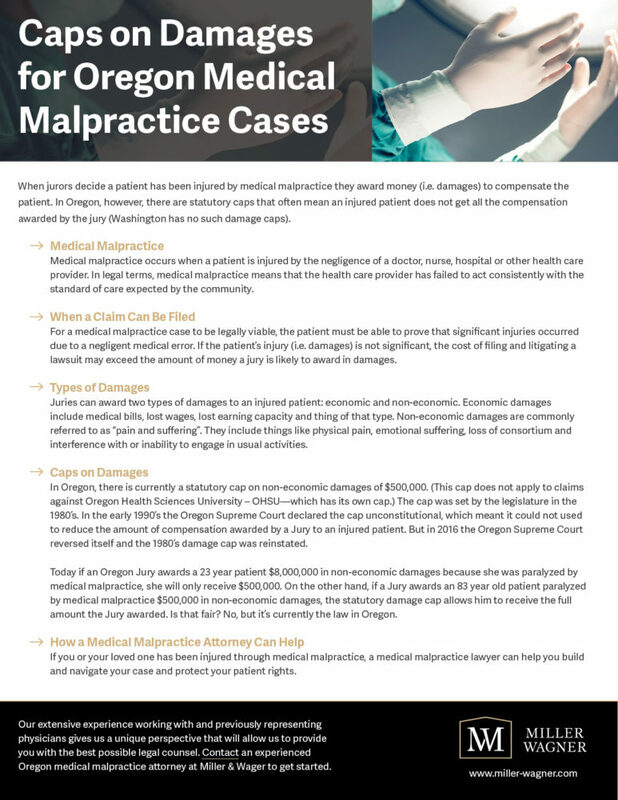 The case involved medical malpractice claims brought under the Oregon Tort Claims Act in which the plaintiff received a jury award of over $12,000,000, and the defendants invoked the damages cap of the Torts Claims Act ($3,000,000). In response, the plaintiff challenged the cap as unconstitutional under Oregon’s Jury Trial Clause and Remedy Clause, and the Court reversed its previous position. Oregon legislature can impose damages caps without violating the constitution in most circumstances. The only instance where a damages cap is ruled unconstitutional is when the cap’s ceiling is insubstantial when compared with the jury’s award. Who Is Impacted By Caps On Damages? Caps on non-economic medical malpractice damages are the same for people of every age and demographic and will typically have the most negative impact on very young patients. For example, if a 72-year-old woman undergoes damages from medical malpractice during a surgery, she could receive up to $500,000 for her claim. However, if a 5-year-old boy suffers a similar injury due to medical malpractice and is unable to work later in life, his damages cap is the same. The cap does not take into account a person’s age or potential lifespan or future earnings. Why Are There Caps on Damages? Non-economic damages caps are set in an attempt to manage high insurance premium costs as well as the cost of business operations. Some believe that raising or removing the cap on pain and suffering damages will lead to insurance costs skyrocketing, which will cause higher rates for everyone. A negligent mistake by a doctor can have devastating consequences for the patient, in which case a jury may be inclined to award million dollars for non-economic damages. In most cases, the doctor’s medical malpractice insurance company would pay for the damages, which would lead to increased premiums. At Miller & Wagner, we represent injured patients. If you or your loved one has suffered an injury from medical malpractice, contact one of our experienced Oregon medical malpractice attorneys. With over 30 years of experience working with physicians, our lawyers are trained and knowledgeable about the laws and caps on non-economic damages for medical negligence claims and will guide you through your legal case. Our extensive history of working with and previously representing physicians gives us a unique perspective that will allow us to provide you with the best possible legal counsel.